As general rule of thumb, Revolution HEF Systems only need to treat 5% of a water loop’s overall flow rate for open loop systems (2% for closed loops). Factors that will further determine proper sizing are: Desired water quality, daily, weekly, and annual run time(s), water loop location and/or environment, and also the existing type of foreign suspended or particles (materials) in the water loop. For more information on HEF System Sizing, refer to the sizing chart below. 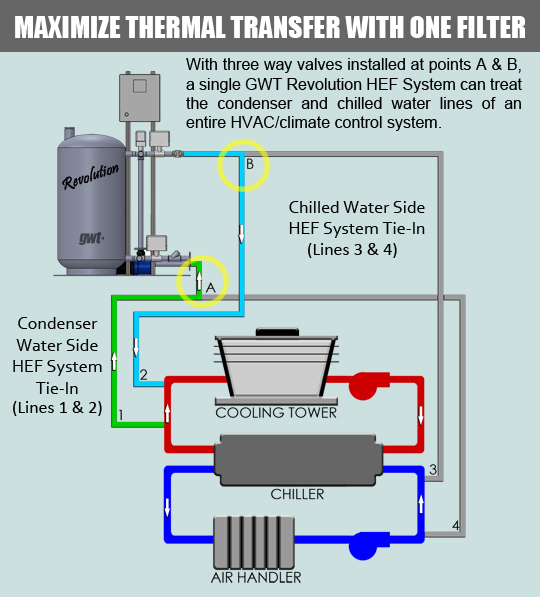 Always consult Revolution HEF System Sizes with your Authorized GWT Representative. * Flow rates may be adjusted down to increase small-particle removal efficacy. ** Multi-skid packaged systems are available to meet custom flow requirements. *** Sizing verification and pricing is available through any Authorized GWT Representative. Custom designs and optional features are available on all Revolution Series models. Optional features are not limited to the items listed above. GWT welcomes all custom requests and recommendations.